Discover the joys of printmaking by hand and on our fabulous presses and create something beautiful. Explore linocut, monotype and/or dry point etching. 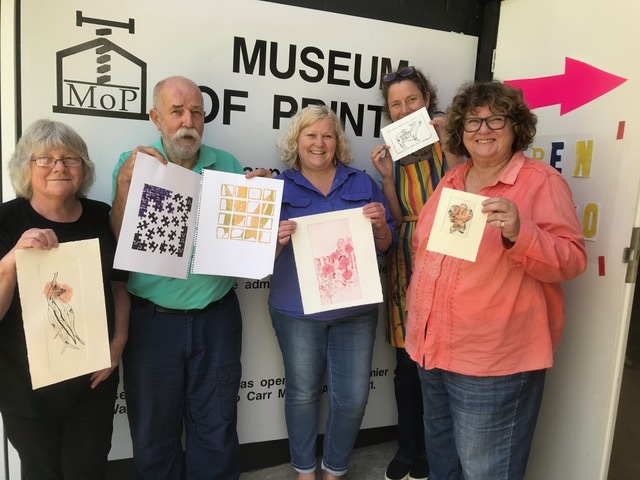 Suitable for beginners and experienced printmakers who would love to print in the Museum of Printing. Lizzie will guide you through your project from planning to printing; come with your ideas and leave with an original print. Suitable for beginners and experienced printmakers who would love to print in the Museum of Printing. Lizzie Horne is an experienced printmaker and teacher whose work has been selected for major national exhibitions including Inkmasters in 2018 and 2016. A foundation member of the Black Gully Printmakers, she was the inaugural winner of the Helen Dangar Memorial Art Bursary, which allowed her to further her printmaking studies in Florence. She has just returned brimming with new ideas, skills and enthusiasm. Equipment: Basic equipment provided but byo materials, including paper, ink and whatever type of plate you would like to use, plus items like tracing and carbon paper, sharpies and pencils. If you are a beginner it might be a good idea to talk to Lizzie before purchasing materials, or to wait for the first class. Limited range of plates available for purchase from tutor. Please wear closed-toe shoes for safety, and loose, comfortable clothing that you don’t mind getting ink on. Please tie back long hair. If you are unsure about any aspect of this, feel free to phone Lizzie on 0487184059.